The thought of returning home this past summer got me giddy with excitement. After having not been back for a year, the idea of consuming incredible Malaysian food instead of Chinese takeout from Noodles was something that got blood pumping through my veins. Ask anyone around me whether they know of my obsession with Malaysian food and 95%--if not all of them--would reply with “Unfortunately, yes I know.“ The Malaysian food scene is rich with many different types of cuisines including Malay cuisine, Chinese cuisine, Indian cuisine, and the Peranakan cuisine, to name a few. Each of these cuisines has their own distinct flavor profile, history and traditions that makes them unique. 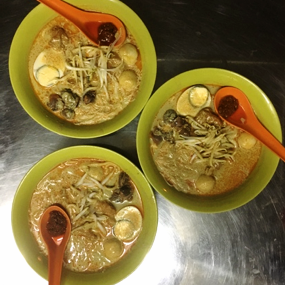 I had an American friend visit me over the summer and I thought what could be better than for me to introduce Malaysian food to her and to the Bite blog at the same time. I wanted to come up with the top 15 Malaysian foods to try, but after going through my photo album, I realized that it was almost impossible for me to pick just 15 of my top favorites because each dish was so different! So, without further ado, I will introduce you to 23 glorious Malaysian dishes! Ask any Malaysian and they will tell you that nasi lemak is the unofficial national dish of the country. It is comprised of rice cooked in coconut milk and accompanied by a variety of ingredients such as sliced cucumber, boiled eggs, peanuts, anchovies, some kind of meat (usually fried chicken, rendang chicken or sambal squid) and sambal. Sambal is a form of chilli paste and the ones used in nasi lemak usually have an anchovy base. In the picture above, a restaurant in Kuala Lumpur (Mama Lee in Damansara Uptown) puts a twist on this classic dish by serving nasi lemak with salted egg yolk fried chicken and boy oh boy, do yourself a favor and try this dish if you are ever in town. Rendang is a dish that is made by braising some meat, usually beef or chicken, in a variety of spices and coconut milk. The process tenderizes and seasons the meat, creating an incredibly rich and flavorful dish. The one pictured above was made by one of my mum’s friends. She used a grand total of 14 spices for just this one dish. This one included lemongrass, garlic, coriander, ginger, cardamom, sweet cumin, white cumin, dried tamarind slices, star anise, galangal, lime leaves, onion, cinnamon, and turmeric leaves. Nasi impit, on the other hand, is rice that has been cooked and pressed together to form a tight cube. This is usually served with rendang instead of regular rice. Hokkien Mee is a noodle dish stir-fried in thick, dark soy sauce with some cabbage and pork. The secret to a good plate of hokkien mee is definitely the deep fried pork lard that’s thrown into the mix. This adds a form of crunch and sinful goodness, balancing the flavor profiles of the dish. In all Chinese dishes, what matters the most is the ‘wok hei’; when directly translated, it literally means the “breath of the wok.” This is important in dishes like these as it imparts flavor complexity to the dish. Char kway teow is a stir-fried rice noodle dish, topped with bean sprouts, prawns, and cockles. Sometimes, sliced Chinese sausage is thrown into the mix, as well. Again, what makes or breaks the dish is the “wok hei,” and if absent, the essence of what makes a good plate of char kway teow would be missing. Laksa is a broth noodle dish with multiple variations as it travelled from state to state. One prominent variation is the Penang asam laksa that can be found on the island of Penang. It has thick udon noodles served in a tamarind-based broth. This dish gives off a fishier taste as the base of the broth consists of mackerel fillets. The base spice mix is prepared from minced mackerel fish fillets and many Malay spices including lemongrass, mint, tamarind pulp, laksa leaves, torch ginger buds and belacan. It is usually served with mackerel fillets, diced onions, shredded cucumber, chopped pineapple, lettuce, mint and Vietnamese coriander leaves. This variation of laksa is from the Peranakan culture. Peranakans are a result of two traditions colliding: the Malays and the Chinese. Curry laksa is a dish consisting of rice vermicelli in a fragrant, spicy broth and is garnished with prawns, eggs and bean curd puffs. The base spice mix is a curry paste that includes a variety of Malay spices including shallots, lemongrass, garlic, coriander seeds, chili paste, and shrimp paste (belacan). 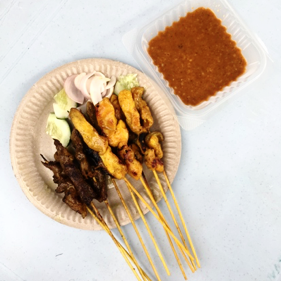 This well-known dish requires no introduction as I’ve seen it on quite a number of international menus, but essentially, satay is marinated bite-sized chicken, lamb or beef on skewers that has been smoked to perfection. It is always served with a peanut sauce, as well as some cucumber, nasi impit and raw onion to cut through the umami flavour of the meat. This snack is often used to describe the Malaysian culture as the word “rojak” means a mix of different things. There are fruit rojaks and vegetable rojaks and Indian Pasembur rojak but rojak is most often a mix of fruits like apples and mangoes and vegetables like cucumber and jicama. All of this is then tossed in the rojak sauce which is a sweet, slightly spicy and thick sauce, followed by a garnish of crushed peanuts. Cendol can be best described as a mountain of shaved ice piled high into a bowl and topped with red beans, green jelly-like rice noodles flavoured with pandan leaf and a splash of creamy coconut milk. A generous drizzle of dark brown, syrupy gula melaka (made from Malaccan palm sugar) completes the dish. Roti bakar is toasted bread slathered with generous amounts of butter and kaya (coconut jam). It is usually toasted the old, traditional way, on top of a bed of charcoal, thus delivering a pleasant smoky aroma. It is often eaten with half-boiled eggs for breakfast. Nasi kandar is a popular northern Malaysian dish originating from Penang. The dish starts off with a bowl of steaming white rice which is accompanied by a variety of curries and side dishes of one’s choice, including brinjal, chicken, lamb, beef, eggs, cucumbers, okra, squid, squid eggs and many more. Most people also eat it with acar (a form of fermented vegetable) as it lends a sharp, sour and sweet flavour to balance out the richness of the curries. Wan tan mee are egg noodles tossed in a simple soy sauce and served with wan tan (dumplings). The dish also includes char siew (BBQ pork) slices and some vegetables. This dish definitely wouldn’t be complete without a serving of anchovy-based soup. Similar to nasi kandar, the Indian banana leaf rice is a mixture of rice and a bunch of different curries that’s served with various vegetables, fried bitter gourd, and a choice of meat such as mutton, chicken, fish or crab curry, all on a piece of banana leaf. The best way to enjoy this dish is by eating with your hands. Teh Tarik, when translated, means “pulled tea.” It is a mixture of tea, condensed milk and evaporated milk that when mixed in the right proportions, creates a really rich milk tea. The tea is then “pulled” by repeatedly pouring the tea from one cup to another cup from a very tall distance. This creates a lot of foam at the top and aerates the tea, providing a smoother, silkier taste. Roti canai is a kind of flaky, light flatbread made by mixing some form of fat (margarine or ghee is usually used), flour and water. The dough is repeatedly stretched, pulled, folded and kneaded to create layers and to incorporate air. The dough is then stretched paper thin and fried with a little oil on a flat grill. It is usually served with dhal (lentil curry), chicken or fish curry, sugar or condensed milk. Over the years, people have created variations that includes topping the roti with banana, Milo, onions, cheese, and eggs. The possibilities are endless! And that, folks, is only about 70% of the Malaysian goodness that I could afford to stuff my face with this summer. Be sure to put Malaysia on your bucket list to discover the other 30% of this food heaven.